The 2017 Books for Schools Donation Campaign is nearly finished. The last 4 schools are up and collecting donations of PBS Credits and PBS Money. This year we are hoping to give 10,750 books to 9 deserving schools across the county and we have almost reached our goal. Most of us can’t imagine what a childhood without books would have been like. Please help us to get books in the hands of children and to share the love of reading with them. These are children who may never otherwise have a book to call their own. We have nine participating schools this year from all over the country, including a school in Florida that was affected by Hurricane Irma, a school in Texas that has taken on students displaced by the flooding from Hurricane Harvey, and a school in Queens that has a high percentage of its students living with nonparents, in foster or shelter situations. You can read more about each school on the Books for Schools page where you can also donate Book Credits or PBS Money. It’s the best kind of holiday glow…giving the gift of reading. May your holidays be full of love and laughter and books! Announcing Books for Kids 2017! And now donations are Tax Deductible too! A love of reading has a lifelong impact — no one knows that better than a member of PaperBackSwap! We’re constantly being asked by members if we can expand our annual Books for Schools campaign, to get more books to more needy kids. We set out to find more organizations who would like new books. We didn’t have to look very far: sadly, PaperBackSwap’s home state of Georgia’s school system is ranked 32nd in the US, and it has the largest dropout rate in the country. We plan to select a different US state for each future round of donations. Our goal is to give each child 2 books for their summer reading. All the teachers are being encouraged to ask the kids to bring the books back to the classes in the Fall, so that they can swap them with other kids. A great way to learn about sharing! You can make your donations of Book Credits and/or PBS Money to either the schools or the camp (or both if you like!). We’re thrilled to note that one of our members, Jerrie , volunteered to donate ALL of the credits to supply one of the schools (Midway). A huge donation from a huge heart! Thank you, Jerrie — the students at Midway will love their books! If you have a lot of credits, and want to make a big donation, please contact us for help facilitating that. We thank all of our members who donate — no donation is too small! Every single Book Credit turns into a book for a child, and a single book has the power to change a life, as PaperBackSwap members surely know. We believe that fostering an early love of reading helps kids all through their lives! Thanks for considering a donation of some of your unused credits and PBS Money to these worthy charities. *We can’t offer tax advice, so please consult your tax preparer to discuss this in more detail — she or he may want to consider the cost to you when taking the deductions for Book Credits. For example, if you purchased the Credit from the Kiosk, then that price could serve as the basis of your tax estimate, whereas if you mailed a book to earn the Credit, then the cost of the postage, wrapping materials and gas expense to visit the Post Office could all be figured in. Again, please talk to your tax preparer about how best to take advantage of making a donation to a charity. Books for Schools 2016 is nearly complete! As of right now, the last 2 schools are up collecting donations. That will make the total donation this year 11,750 books for 8 deserving elementary schools. Some of these children have never had a book to call their own. Through our generous members, the Books for Schools donation program changes that! We thank you for helping to put hands in the books of these students and for sharing the joy of reading. We thought you may want to see why we LOVE this program. These are just some of the photos we have received from our recipient schools over the years. Seeing the joy on the children’s faces makes us smile. Invite Friends to Join PBS! Earn $ and Spread the Word! If someone handed you a $5 bill, would you put it in a pocket and never spend it? We hope not! Yet, some of you are doing the equivalent of that right now, and you may not even know it. Some members who have referred friends after the start of the program in November 2015 have become eligible to claim a cash reward, but haven’t done that yet! Are you one of those members? Scroll down on that page to see your list of referred accounts and if there is a Claim Your Reward button there, click it! Then choose a check mailed to your home, or PBS Money. That’s all you have to do. Could NOT be easier. And if you don’t yet have cash to claim, it’s easy to get that started. You can Learn More About Inviting Friends in the Help Center. For you, it means a Cha-Ching! of always-welcome cash. For your referred friend, it means a discount on Annual Membership and entry into a world of online bookswapping. For the club, it means more members and more books to be shared with all of us. It’s win-win-win! It’s that time of year again…time for us to reflect on the joys of summer as we enter into the Fall season. The leaves are starting to turn, and there is color in the hills. I like to sit back and enjoy the peace and quiet that this time of year offers, to be able to take stock of things and really think. Then I remember a good book that I have read, and want to read it again. My favorite book of all time is Tolstoy’s War and Peace. To read it and understand the hardships that people went through in that era, and to try to fathom the depth of the characters in a war-torn foreign country. It comes across to me as more of a philosophical piece that really makes you think. About yourself, your loved ones, acquaintances and also those people we don’t care for or want in our lives. What book has inspired you? Made you think? Please share your opinions, ideas and inspirations with us by adding your comments below. As we head into Fall, I hope that you are finding peace and joy in the love of reading as much as I do. So many of you have asked when our school donation program will launch again – we’re happy to announce that Books for Schools 2014 is now live! Each year PaperBackSwap, through our generous members, donates brand-new books to selected deserving elementary schools across the country. The goal of the program is to provide children with books that they can read for pleasure. Most of us in the club learned the love of reading at an early age, and this is a great opportunity to share that joy. In the past three years PaperBackSwap and our members have donated over 70,000 new books! 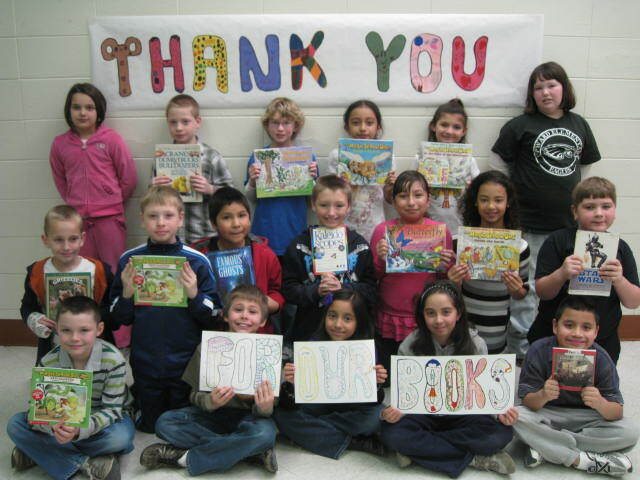 Last year, we reached our goal of 25,000 books sent to 24 deserving elementary schools. Check the details of last year’s recipient schools to see wonderful photos of the children receiving the books (here is an example from last year), and see their thank-you cards. If you know of an elementary school in need, suggest it here and we will consider it for our next Books for School donation drive. Your donation of credits and/or PaperBackSwap Money (which is used to defray some of the shipping costs) or both help us to put books in the hands of children. Together PaperBackSwap and our wonderful members do make a difference! Most of the participating schools this year are large, with enrollments of between 400 and 700. The school roster includes a special-ed school in AL, and a school in WV that does not actually have its own library – the local library they visit weekly has stepped up to collect and distribute books to the students (bravo to them for helping with this)! And those of you who read the blog post about our visit to the Belize Children’s Home might want to look in on the Adopt-a-School drive for the abused and abandoned children who are being lovingly cared for there. Thanks in advance for your help – the kids really appreciate the books!